What would best accompany your entree? 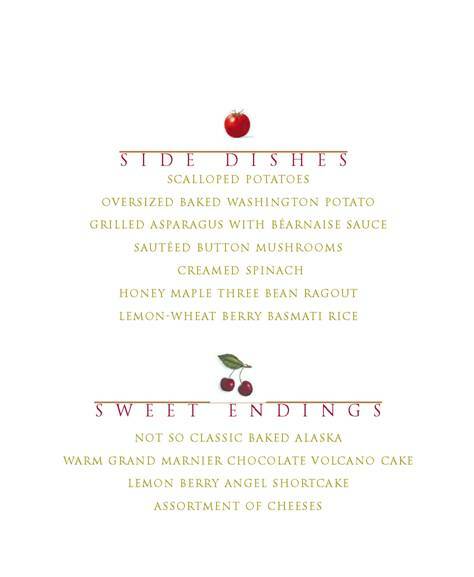 Scalloped Potatoes, Grilled Asparagus Avec Bearnaise, Sauteed Button Mushrooms or a Honey Maple Three-Bean Ragout? But leave room for dessert. Who can pass on Warm Grand Marnier Chocolate Volcano Cake or Not-so Classic Baked Alaska. Or maybe Lemon Berry Angel Shortcake. All sound berry wonderful.